The Kelly family has quickly become one of my most regular families that I photograph! I first met this beautiful family back in September of 2015 for some beach family photos at Horseneck Beach in Westport, MA. Since then, I've photographed the Kelly family five more times! The last time I photographed them, it was in the fall of 2016. It was then that Ashley told me she was pregnant with their fourth child, another boy! Three boys and one girl! Bless their hearts! All three siblings were very excited to tell me all about their new brother, and couldn't wait to meet him. Ashley told me she was due in March, and she was hoping to schedule an in-home lifestyle family session with the new baby. Of course I said yes, and we scheduled the session then! What are Lifestyle Sessions, do you ask? Lifestyle sessions are where I will come in to your home and photograph your family in a more fun and relaxed environment. While I will still capture some formal photos, I will also capture candid photos of your family being themselves. These sessions are meant to be fun and casual! They are great for families who are busy, and just want some everyday photos of you being you. I thought this would be perfect for four children, one being brand spankin' new! I arrived at the Kelly home in Dartmouth, MA and was immediately in love with all of the natural light in their home. And, that their house was immaculate! How they keep it that clean with 4 kids, I will never know! I loved it. I had so much fun photographing them for the time I was there, and I simply adore the photos that I captured from it. I captured a variety of poses in a short amount of time, including who family photos and sibling poses. 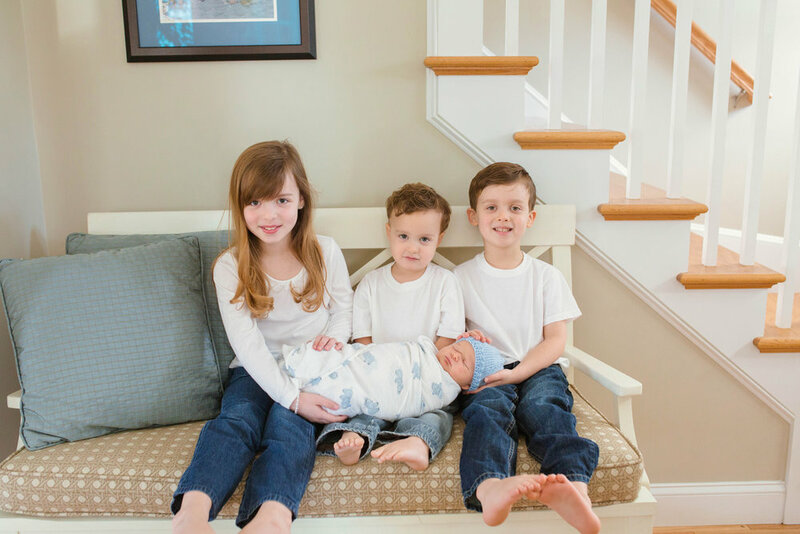 I loved seeing how each sibling interacted differently with their new baby brother. That was so wonderful! I even captured a couple of baby Stafford before he got fussy! Overall, I had a wonderful time. Here are some of my absolute personal favorites from this lifestyle family session!